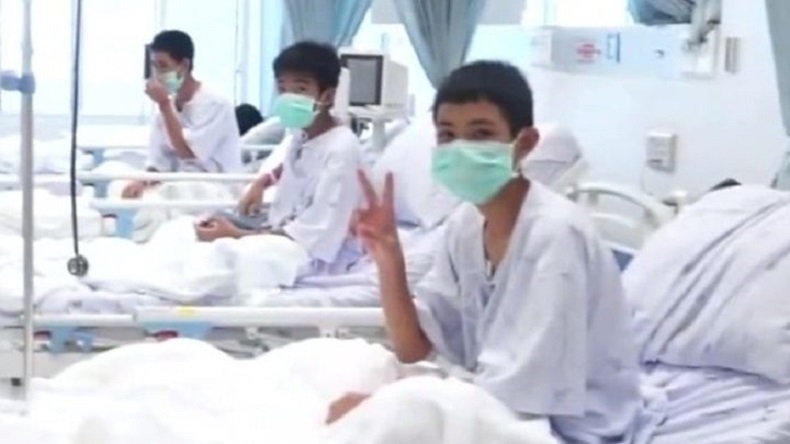 The first visuals of the Thai boys rescued from a flooded cave after 17 days was released on Wednesday showing them smiling and waving from their hospital beds. The 12 boys have lost an average of 2kg weight during these 17 days but reportedly they are in good shape and have shown no sign of stress. The first visuals of the Thai boys rescued from a flooded cave after 17 days was released on Wednesday showing them smiling and waving from their hospital beds. The 12 boys have lost an average of 2kg weight during these 17 days but reportedly they are in good shape and have shown no sign of stress. Thailand reacted with relief and gratitude after the last of the “wild Boars” soccer team was rescued from the Tham Laung cave, on Tuesday night, bringing an end to the 17-day ordeal that gripped the world. “Boys were just being children when they got lost and no one was to blame, Rescue mission chief Narongsak Osottanakorn was quoted by reporters as saying. In the video shown to the reporters, none of the boys was heard speaking but they were seen making peace sign gesture for the camera. After being rescued one-by-one, the 12 boys were taken by helicopter to a hospital in the town of Chiang Rai about 70 km away, to stay in quarantine. According to authorities, the boys will have to stay in hospital for up to 10 days. Then they will have to recuperate at home for 30 days, as per hospital director Chaiwetch Thanapaisal. Parents of the 1st 8 boys freed have visited their wards but they could not hold them and had to stand 2 metres away as a precaution. Authorities are worried about infection picked up in the cave. Thailand Prime Minister Prayuth Chan-ocha asked the media that boys be given time to recover. The group had gone into the vast cave complex in the northern province of Chiang Rai after soccer practice and were trapped due to heavy rains. They were lost for 9 days and then British rescue divers discovered them on July 2 sitting on a half-flooded chamber. Gitting them out was a tough challenge as the boys were not strong swimmers. A former member of Thailand’s navy seal unit had died during moonsoon in the cave last Friday. “We are not heroes. This mission was successful because of cooperation from everyone for SEALs, this is what we were trained for. The navy has a motto: `We don`t abandon the people`.” the commander of the navy SEAL unit who oversaw the rescue, Rear Admiral Apakorn Yuukongkaew, was quoted as saying by Zee News. Official help came from all over the world, Britain, the United States, Japan, Laos, Myanmar, China and Australia, a government document showed. There were volunteers from Denmark, Germany, Belgium, Canada, Ukraine and Finland.